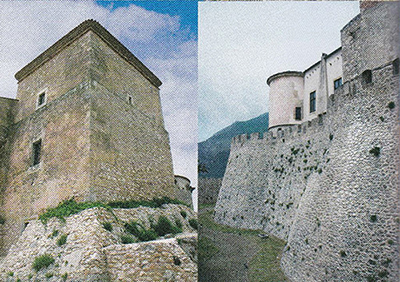 Prende il nome dai Pandone che furono signori di Venafro nel XV e parte del XVI secolo, il castello oggi restaurato dalla Soprintendenza del Molise. La prima fortificazione fu eretta dai Longobardi nel X secolo sulle rovine di una cinta megalitica del III secolo a.C. In seguito, alla torre fu aggiunto un recinto rettangolare. Nel corso del XIV secolo la fortezza fu dotata di torri circolari per essere poi isolata da un grande fossato nel XV. In questo stesso secolo subì, ad opera di Enrico Pandone, poi decapitato nel 1528, sostanziali modifiche, divenendo autentica residenza rinascimentale: sulle sue mura, ad occidente, fu aperto un loggiato, all'interno fu realizzato un giardino all'italiana e varie sale furono decorate con gli affreschi dei 26 cavalli della scuderia di Enrico Pandone. È una splendida galleria di immagini che rende onore alla razza equina e fa del castello di Venafro un unicum nel Molise. It takes his name from the Pandone family, who ruled Venafro in the 15th century and in the first half of the 16th century. The Monuments and Fine Arts Agency restored it. The Lombards built up a first stronghold in the 10th century on the remnants of a megalithic wall dating back to the 3rd century B.C. A rectangular palisade was added to the tower afterwards. The stronghold was fitted with two round towers in the 14th century and then surrounded by a deep moat in the 15th century. Enrico Pandone, who was beheaded in 1528, turned it into a Renaissance manorhouse. A loggia was built up in the west side and an italian garden was set in the Castle. Many halls were embellished with frescoes displaying 26 horses from Enrico Pandone's stables. 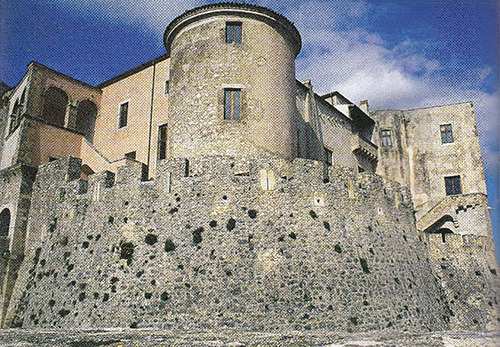 It is a wonderful gallery which honors horse breed and makes Venafro Castle a one-of-a-kind in Molise District.